David Shen, member of the newly formed North Old Palo Alto neighborhood group, discusses with Weekly journalists the group's concerns about the city's rail redesign and its efforts to protect properties from eminent domain. Rather than bemoan all the traditional options of grade crossings and pushing for an unrealistic tunnel, this group should be pushing for studies on an elevated viaduct option with built-in soundwalls. This could be built without significant land acquisition or major disruption to existing train and traffic. Look at the recent letters written by someone named Cedric to the Rail Committee. He's got a good idea, and he included a crude rendering. It would also reduce train noise (possibly to ~20dB) for everyone while creating a new green bike/pedestrian corridor underneath. Do you have a web link for Cedric's letters? David was the star of that video interview/presentation...very articulate in explaining everything about his involvement in the NOPA group, how it got started, etc. I wonder if he would ever consider running for CC! He seems to be clear headed, a logical thinker, a common sense person, looking out after his neighborhood. Maybe he would be willing to be a voice and let that concern spill over to other neighborhoods in my town. He doesn't appear to be one who could be easily bought by developers or their surrogate lobbying group, PAF. What odds will anyone give me that CC will arrive at a recommendation by the end of the year? I put money on "I'll Have Another" in the Kentucky Derby in 2012. Actually, I was betting on the jockey, Calvin Borel, and not the horse. They finished last! "It would also reduce train noise (possibly to ~20dB) for everyone while creating a new green bike/pedestrian corridor underneath." 20 dB noise reduction means the noise is reduced to 1/100 of its original level. That is a very easy thing to say, but a very difficult thing to achieve and maintain in the real world, even in Silicon Valley. Get a live full scale demonstration before you commit millions of dollars to this spiel. The sound wall would act as an optical barrier as well as an acoustical one, so Caltrain passengers aren't peering into people's back yards. It would also make the structure more topheavy, a seismic concern. My idea is to accomplish the same thing with shrubbery. Either way you'd get a modicum of acoustical isolation but nothing dramatic, but shrubs would be an effective optical/privacy barrier. The "reverse hybrid" crossing David Shen suggests in the video has issues (raising the roadway and lowering the tracks). You would have to construct ramps on either side of Alma/the tracks so that traffic could reach the top of this structure and come back down again. Given the height and permissible slope, these ramps would extend on the order of 200 feet in either direction. The problem is that Churchill is very narrow, scant over 30 feet wide, so where would these ramps go? Long story short, there's no room for them. They would have to be at least 20 feet wide (two 10-foot-wide lanes in each direction) and this would affect driveway access and the passage of through traffic on Churchill, even if you prohibited turns to and from Alma. Instead of a conventional hybrid crossing that is parallel to the tracks, you would have a raised structure that is perpendicular to the tracks, similar to San Antonio Rd., except that the tracks would be depressed. Moving the tracks is non-trivial, taking into account the permissible slope and the length required to reach the desired depression. Caltrain will permit a 1% slope but requires a variance for anything steeper. This idea was examined a short time ago. What seems like a good idea in your mind sometimes doesn't pencil out. Note that every 10dBA reduction in noise reduces it by half, so a 20dBA drop would make the passing train be 1/4 of the sound without such noise barriers. 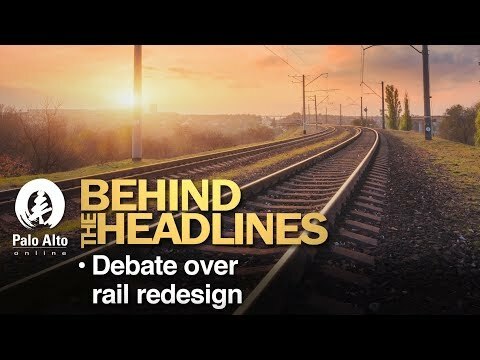 It should be noted that elevating the train off the ground is said to increase the sound by 10dBA, so in theory raising the train with the appropriate noise barriers would have a net effect of halving the noise vs leaving it at grade without any noise barrier. That does not include the additional reductions from current noise levels due to no longer needing to sound the train horns as it approaches crossings, and from switching to electric from the very noisy (and polluting) diesel locomotives. Therefore elevating the train with the noise barriers and it being electric trains as intended, would lead to a net decrease by more than half from current conditions. The overall height of a viaduct could be reduced from the sketches posted by using a U-Section deck. The U-Section is more difficult to build because it has to be cast-in-place as a single piece of concrete, so the local road would need to be closed during construction, but that is a small price to pay to have a lower viaduct. The classic solution is to make the bridge from thick pre-fabricated I beams that are lifted into position over the weekend but result in a chunky viaduct for the next 100 years. A viaduct deck in PA does not need to span any long distances, so it can have a thin deck supported by many columns. nevayarkin@gmail.com is a registered user. We have no time to waste on train options! To study each option could be $200,000 to $300,000. Palo Alto resident paying thousands of dollars every year for 30 years. Can Palo Alto residents afford that? Can we afford 1 or several lanes of Alma being closed for years?? As noted above, a tunnel under Churchill would be extremely expensive. Tunneling under crossings which are already grade separated (Oregon, Embarcadero, Churchill) at several million dollars per mile of tunnel would be extravagant in the extreme. In addition, raising and lowering railroad tracks is a non-trivial proposition and would require the approval of Caltrain. The slope of the tracks must be considered as well as the length required to achieve the desired elevation. The first H.M.M. study did not consider a tunnel under Churchill but brought the tunnel/trench to grade around Matadero creek. You must first address the question of where a tunnel would begin and where it would end. The trains would have to be brought back to grade at some point in order to cross S.F. creek. City staff have already discarded the idea of a tunnel all the way to S.F. creek due to the infeasibility of crossing two political boundaries at the creek. If the elevated structure is too unsightly for residents of Southgate, doing nothing at Churchill, leaving it as an at-grade crossing as it has been for decades, is an attractive option. "We have no time to waste on train options!" The City of Palo Alto has dragged its feet for years on this issue and still doesn't have a plan, while neighboring cities zip past us. The so-called CSS or "Context-Sensitive Solution" approach can only drag out the process even longer. "If tunnel option is chosen it would cost 4 billion (or maybe double) that would come to each Palo Alto resident paying thousands of dollars every year for 30 years. Can Palo Alto residents afford that?" You forget: money grows on trees in Palo Alto. "Cost overruns" are a very real consideration. These projects always go over budget (c.f. Bay Bridge). >>> The "reverse hybrid" crossing David Shen suggests in the video has issues (raising the roadway and lowering the tracks). Additionally a shallow trench has many of the costs of a deep trench: severed utilities, blocked underground rivers, shoofly tracks, prone to flooding, etc. without the advantages of a deep trench. Also the local road would need to be closed for years, because the shallow trench would need to be build first, and only after the tracks have been moved back into the trench can the low road bridge be started. Sounds like a terrible value-for-money option. Look at Cedric's idea if you haven't yet. Trains on the lower deck, a bike path open to the sky on the upper deck. It’s a positive development that people like Dave Shen and others are becoming well informed and engaged on the biggest and most expensive Infrastructure project in city history. The Reverse Hybrid and Aerial options made the new top 10 list of alternatives, but they were not even among the set of 34 that staff considered and ranked, go figure. In addition, whether an alternative results in la large number of homes being taken is a Tier 2 value. . This all goes to support the idea that, if the community believes a better and less rushed process is needed, they need to let the staff and the city council hear that. Otherwise, the current plan is to further narrow options within a few months and have a final decision by year end. Pat Burt: A "reverse hybrid" crossing is D.O.A. at Churchill for reasons explained by me and bob.smith at some length in this thread just a few posts ago. In short, there would need to be ramps, one on each side of the tracks, for autos to reach the top and drive over this structure. Bottom line: Churchill is a narrow street and is simply not wide enough to accomodate such ramps. A few minutes spent measuring the distances on Google maps make this clear. Churchill is scant over 30 feet wide. A two-way bidirectional ramp would require two lanes at a minimum width of 10 feet each, or 20 feet. This leaves 10 feet of width on Churchill. Divided by two for bidirectional traffic leaves but 5 feet in each direction. This would encroach on driveway access for the affected residences and two-way traffic would be out of the question. Staff has not yet analyzed the Reverse Hybrid to determine the potential depth of trench and the rise in the roadway over the tracks. It is approximately 1500 feet from Embarcadero to Churchill so as much as a 30 foot deep trench may be possible at a 2% grade. This may be nearly deep enough so that only a minor rise over the trench may be needed, but no one really knows yet because that preliminary engineering has not been done and I don’t count my armchair engineering as adequate. Pat Burt: Even if the tracks can be lowered, the much bigger challenge is in building approach ramps to get over the crossing as I have described in some detail here. There would need to be at least 14 feet of vertical clearance between the tracks and the bottom of the roadway, probably more. Anyone who analyzes this crossing will soon find that Churchill Ave. is too narrow for such access ramps. There is the possibility of building a much smaller version of the San Antonio crossing without lowering the tracks. If the tracks will be lowered by only a few feet, it might not be worth the effort, expense and construction disruption to lower them by such a small amount. Again, the hindrance is in getting over the crossing and constructing access ramps. It would be possible to widen Churchill by taking property but I won't even entertain such a notion. If there is room for a 30-foot trench at Churchill, it might not even be necessary to build an overpass at this intersection. Sink the trains and have the autos drive over the trench at grade. The constraint is getting the tracks back above Embarcadero underpass with acceptable curves and gradients. Churchill over-crossing would need to be raised a bit. Would using extra thin bridge deck and adding a 2% cross slope to Alma be enough? Cedric's idea is looking even better. Thanks to Bob Smith for posting the link to a graphic showing elevations and distances at Embarcadero and Churchill. The good news is that a 2% grade for a trench would likely be approved by Caltrain. The distance appears to be more than 1500 feet. Like all of the alternatives, much additional engineering is required. I'm not arguing that this is the alternative that should be selected, merely that it appears viable and promising. Distance is 1545 feet, but a 110mph train needs a ~10km radius curve at each end of the slope so that probably makes the grade more than 2%. Are you sure Caltrain would approve their flat wide property being turned into a narrow roller coaster? I can't see why they would. Even if you halved the depth of the trench to 15 feet, judging by eyeball it still doesn't look possible to bring the tracks back to grade before Embarcadero. Don't forget; the Caltrain Stanford "station" is at Embarcadero. I'm sorry folks, I have to say it. I grew up a very short distance from Alma and N. California Ave. I used to walk to Paly on Alma street every morning. The idea of Caltrains hurtling back and forth in both directions on Alma street on shoofly tracks, as would be necessary for these trench/tunnel plans, just seems way too disruptive, especially north of Oregon expwy. Consider that there are residences needing driveway access to their properties along this stretch of Alma. There is also the complexity of building diversion tracks on both ends to get from the main line to the shoofly track. This would add even more to the expense of the project. What would be the status of Alma while the shoofly tracks are in place? Would it be one very narrow lane? Would it be closed entirely to all automobile traffic? Alma is a major artery. Even though the shoofly tracks would be temporary, it would be hell on earth during the time they are in place. An elevated structure such as Cedric suggested is looking better all the time. As with any architectural edifice, such a structure can be designed to be aesthetically pleasing. Adding plenty of greenery would help greatly in this regard. The prospect of a bike path on the upper deck of an elevated structure is appealing. For those who simply can't tolerate an elevated structure, another option is to leave the crossings at grade as they have been for decades, and simply deal with the ever-worsening gridlock. Churchill has a low volume of automobile traffic so this might be an attractive option there. The crossing gates would be open and the crossing passable a majority of the time. Your worst times would be during rush hour. Perhaps restricting turns onto and off of Alma from, say, 3 pm to 7 pm would help. If an elevated structure, even one that is aesthetically pleasing with acoustical and optical privacy barriers, is just too intolerable for your aesthetic sensibilities, another option is to sell your multimillion-dollar Palo Alto home and get away from the trains altogether, say to Woodside. How about a pedestrian/bike overpass at Churchill. Leave the train alone, and auto traffic slightly improved without pedestrians & bikes around. Good for Paly High traffic. Minimal construction disruption and much lower cost. Doesn't fix everything, but could be a partial solution. And stop out of control office construction to deal with increasing traffic. >>>> The idea of Caltrains hurtling back and forth in both directions on Alma street on shoofly tracks, as would be necessary for these trench/tunnel plans, just seems way too disruptive. I seriously doubt that the Alma road bridge over Embarcadero underpass is strong enough to support the weight of a freight train on a shoofly, so add that to the list of expensive complications to trenching under Churchill. "How about a pedestrian/bike overpass at Churchill." The problem remains: where do you put the approach ramps? An underpass would be less conspicuous and wouldn't conflict with an elevated structure. The concept Web Link depicts a zero-height tunnel/trench on a vertical scale where the actual height would be critical. Do you have a version showing its real height? It either case it appears we sacrifice the Embarcadero UC to create one at Churchill. This diagram comes from an analysis Web Link that was done 9 years ago, so it is interesting to see how it has been ignored for 9 years and now suddenly there is a panic to re-invent it. "This diagram comes from an analysis Web Link that was done 9 years ago, so it is interesting to see how it has been ignored for 9 years and now suddenly there is a panic to re-invent it." Yes indeed. And it's encouraging to see that the authors recognized their proposed track line speared the Embarcadero UC, and proposed a low-impact solution. This thing just might work. Appreciate your links. I recognize that it can be confusing because the structure has big chambers below the tracks, which appear to be big enough for a person to walk in, but each of these chambers is actually an "under walkway absorptive plenum" part of the design which helps absorb vibration and reduce noise. It is not clear whether people would ever go in there (like if a train had an emergency) but my guess is that it is totally sealed off. My model also has additional wall height above the windows, thinking to control the wind noise of the upper part of the train, but this additional hight is actually probably not necessary because the wind friction becomes the predominant source of noise when High Speed Trains exceed 140MPH, but the current plan for the Peninsula corridor is for the top speed to be 125MPH, according to the Wikipedia article about CA HSR. "Distance is 1545 feet, but a 110mph train needs a ~10km radius curve at each end of the slope so that probably makes the grade more than 2%. "Are you sure Caltrain would approve their flat wide property being turned into a narrow roller coaster? I can't see why they would." Probably not if the slope is > 2%. "Even if you halved the depth of the trench to 15 feet, judging by eyeball it still doesn't look possible to bring the tracks back to grade before Embarcadero." It is doubtful that there is room for a trench there that would meet the approval of JPB (Caltrain). "there is space for a bike/ped path underneath the tracks"
I don't know how many times I've made this point but the City of Palo Alto DOES NOT OWN THE ROW!!! The rail infrastructure is within the CPA city limits but is owned by Caltrain, with which you would have to negotiate to put a bike path and they would probably want to lease it to CPA. My first impression of the structure you linked to is that it is on a very narrow footing and is topheay. That may be OK in Kansas but California is earthquake country and the bay area is close to a major earthquake fault. First big shaker that comes along and that structure could be on the ground, trains passengers and all. Your absorptive plena would add weight to the upper part of the structure, making it even more topheavy. Study the way the deck is built on the Golden Gate Bridge. It is like an uppercase letter "H", giving it a wide footing and making it more seismically stable. I suggested putting the trains on a lower deck and bikes/peds on an upper deck. Presumably CPA would own the structure on JPB land, so if the structure could be built at all, a bike path could be incorporated into the design and there would be no need to negotiate with JPB for it. I still think yours is a good idea, though. Thank you for your thoughtful comments and general support of the idea. Certainly my models are not construction documents and any option requires proper engineering studies. Regarding bike paths on JPB Right of Way (ROW), yes, it is (mostly) JPB land and would require their permission, but note that the existing bike path from Churchill to the downtown Palo Alto Caltrain station is on JPB ROW and they do not charge the city for this use of their land. I will take a look at the GG Bridge's H-shaped structure. However, note that viaduct structures exist all over the bay area, some of them much larger and taller than this carrying multi lanes of freeways. The BART tracks shown in my prior link is an example and it has survived all the earthquakes since it's construction, including the large Loma Prieta quake in the 90s, and earthquake science has advanced considerably since most of these viaducts were first built. Nonetheless, you'll note that the image on which i based my model was of a two-track viaduct on single center posts, but expressly due to the certainty of earthquakes I put my structure on two posts instead. I estimated the size of the post from the picture and made mine comparable, but that is an engineering detail. Japan has both earthquakes and really high speed trains on viaducts, and I found this quote at (Web Link): "Rigid-frame, reinforced concrete (RC), beam and slab viaducts are common in Japan. They are monolithic structures with a rigid frame of columns and beams and a slab serving as the railway track. This type of viaduct is the most economical and has high resistance to earthquakes. Many shinkansen were built using rigidframe viaducts to cut construction costs and work terms. In fact, such viaducts account for 700 out of the total 2000 km of shinkansen tracks." Also, some people have referred to the train going into a trench up then up onto a viaduct as a "roller coaster". At a 1% permissible grade that means for every 1' the train goes down, it runs 100' (or 50' at 2%). If that's a roller coaster, it would be the most boring roller coaster i've ever ridden! Note that the deck is sitting loosely on the columns so it can all jiggle around separately in an earthquake without anything getting broken. Note that while electric passenger trains are lightweight, the viaducts are being built strong enough to support the weight of two heavy diesel maintenance locomotives, so it may not be necessary to keep a separate freight line open at grade. The right of way in PA is largely wide enough to build two such viaducts side by side to achieve 4 tracks. No shoofly required, move tracks to one side, build one viaduct, move tracks onto viaduct, build other viaduct. The viaduct show is exceptionally high at this point because is it triple stacked above an existing road grade separation. >>>>> "At a 1% permissible grade that means for every 1' the train goes down, it runs 100' (or 50' at 2%). If that's a roller coaster, it would be the most boring roller coaster i've ever ridden!" It is not the grade that makes a roller coaster, it is how quickly the train transitions from flat to grade. Some people are doing back-of-the-envelope calculations that assume there is an instant change from flat to slope. Such a sudden change would indeed induce roller coaster like g-forces in the passengers at 125mph, and the train would literally "take off" at the top of the slope. A minimum vertical curve radius of 10 kilometers should be assumed. Cedric, what does the passing rail requirement that CHSRA is about to drop on Palo Alto going to do to your design? Also, what's funny with all the complaints about trenching (tunneling less so) requiring shoofly tracks, elevating the tracks will also require shoofly tracks on Alma. Building a viaduct or berm will be just as disruptive on the ROW. Any grade separation work will require shoofly tracks. "Cedric, what does the passing rail requirement that CHSRA is about to drop on Palo Alto going to do to your design?" How do you come by the information that a passing track will be in Palo Alto? My B.S. detector is going off. "Any grade separation work will require shoofly tracks." Are you a civil engineer? "How do you come by the information that a passing track will be in Palo Alto? My B.S. detector is going off." You haven't been paying attention to other threads. Even Pat Burt mentioned that it was on the table. It's been common knowledge about the closed door conversations where they are looking for a passing track on the peninsula and Palo Alto is one of the options. "Are you a civil engineer?" Tell me how you are going to build a berm or anything on top of the ROW that won't disrupt Caltrain operations. Especially a design that sticks big concrete posts in the middle of where the tracks are. Hello. Doesn't require a civil engineering degree to see that, if you're going to put something on top of tracks that it will require some alternative means to route around the construction site. A trench or a berm certainly obliterates the existing tracks, but i think we could build the viaduct parallel to the existing tracks and keep at least one track open through construction. Given the significant disruption and cost of putting temporary tracks down Alma, I think it is well worth the effort to at least investigate this possibility.
" i think we could build the viaduct parallel to the existing tracks and keep at least one track open through construction. Given the significant disruption and cost of putting temporary tracks down Alma, I think it is well worth the effort to at least investigate this possibility." Sure we can investigate, but even one of the bob.smith pictures from the viaduct being built for the train-to-nowhere(tm) shows a steel support frame required during construction that goes across the entire width of the tracks for each new elevated section. Given the distance between the tracks on the ROW (not just in Palo Alto) and the necessary area around the viaduct support structure for construction - especially for safety reasons (not sure having construction workers milling about an active railroad is quite OSHA-compliant), I don't see how you can build any sort of viaduct that's parallel unless you take up part -- or all -- of Alma, which would defeat the purpose of not having shoo-fly tracks to begin with. "Even Pat Burt mentioned that it was on the table. It's been common knowledge about the closed door conversations where they are looking for a passing track on the peninsula and Palo Alto is one of the options." Ah. The always-reliable rumor mill. The last time I looked on the CPA web site, Palo Alto was not one of the cities. The passing tracks would be in San Mateo and Redwood City, if my recollection is correct. Mott MacDonald must have contemplated a shoofly track in their design for a trench or tunnel. It would be a shorter track starting North of San Antonio and ending around Matadero creek, rather than all along Alma up to Churchill. One smart aspect of the first M.M. design was that they left Oregon, Embarcadero and University alone. In San Mateo, Caltrain is building a berm to cover 3 grade separations while keeping the shoofly within the right-of-way. The tracks through Palo Alto are much farther apart than they need to be. They are like that because there used to be a third track down the middle. "The most expensive option will be to build the viaduct sections offsite and lift them into place over the weekend"
There are two types of "expensive" as I see it. Expensive in terms of dollars and cents and expensive in terms of disruption,headache and inconvenience. "The last time I looked on the CPA web site, Palo Alto was not one of the cities. The passing tracks would be in San Mateo and Redwood City, if my recollection is correct." Nothing has been decided, and Palo Alto is still on the table. "The tracks through Palo Alto are much farther apart than they need to be. They are like that because there used to be a third track down the middle. " I'm still fuzzy on how long you guys are thinking the tracks should be elevated. The reason why HMM proposed only grade separating to Matadero Creek was the additional cost of elevating/undergrounding Cal Ave, Stanford and Palo Alto stations. Regardless of how you grade separate, Churchill would still have to be at grade or not that much higher in order to make it to an unchanged Palo Alto station. And if you don't elevate high enough (reverse hybrid), here comes the need for shoofly tracks that ODB hates so much. I'll make this point yet again. CPA has a deplorable record of maintaining the pumps at Oregon expwy. If they neglect the pumps in a rail tunnel as they neglect the pumps at Oregon, and a big storm comes along such as in 1955 or many times since, there will be a lot of unhappy people. Again, there is no natural drainage in that area. You have to at least entertain some worst-case scenarios. "I'm still fuzzy on how long you guys are thinking the tracks should be elevated. The reason why HMM proposed only grade separating to Matadero Creek was the additional cost of elevating/undergrounding Cal Ave, Stanford and Palo Alto stations. Regardless of how you grade separate, Churchill would still have to be at grade or not that much higher in order to make it to an unchanged Palo Alto station." The way the discussion has shaken out, I think Cedric's elevated structure is intended more for Churchill where a tunnel would be infeasible for the reasons you enumerated above, i.e. tunneling under crossings which are already grade separated. Phase II: Churchill and Palo Alto Ave.
Leave Churchill and Palo Alto Ave. as is for the time being. It will be challenge enough to finance tunneling under Charleston and Meadow and dealing with the inevitable "cost overruns". If a tunnel is built and if JPB (Caltrain) is smart, the tunnel pumps would be tested and inspected by JPB during the rainy season and the expense billed to CPA. >>>>> I'm still fuzzy on how long you guys are thinking the tracks should be elevated. , that everybody freaked out about, is actually pretty good and something like this will be built in the end. A 5 feet depression of Churchill is not so onerous. You can get 1.2 feet by adding a legal 2% cross slope to Alma, that just leaves 3.8 feet to get from the far side of Alma. Depressing Alma 13 feet at Meadow and Charleston is not so hard because there are few property accesses in that area. - Berm can span full width of current ROW with no property takes. - No weight limits for trains. - No height limits for trains. - No speed limits for trains. - No risk of flooding. - Low risk of show-stopping damage in an earthquake. - No disruption to underground utilities. - No blockage of underground rivers. - Minimal disruption during construction because an earth berm can be built quickly from the inside of the berm with simple tools, with no need for heavy cranes, scaffolding or workers on cherry pickers outside of the berm footprint, which means faster and less expensive construction when building right next to an electrified shoofly. Other cities when faced with the same challenges have concluded in the end that this is the way to go (after stubbornly trying every other option). Maybe start with Meadow and Charleston. >>> "Tunnel from San Antonio to Matadero creek"
Such a short tunnel would be uneconomic given the high fixed costs of tunneling: buying a tunnel boring machine, digging deep launch pits at each end, setting up a factory to make concrete lining ring segments, setting up temporary ventilation system, setting up soil evacuation systems. So we're assuming here that Cal Ave and Stanford (if not Palo Alto) stations will also have to be elevated? "Maybe start with Meadow and Charleston." That's Phase I which I suggested previously. "Such a short tunnel would be uneconomic given the high fixed costs of tunneling: buying a tunnel boring machine"
BUYING a boring machine? What would CPA do with an owned boring machine? I think your contractor provides the boring machinery and takes it away when the job is finished. It's what M.M. suggested. How is it less economical than boring all the way to Churchill, and where would you bring the trains back to grade? Tunnel Boring Machines tend to be Custom, multi-million dollar pieces of equipment. Contractors rarely get to re-use them, so spreading the cost out over a longer tunnel reduces the unit cost of construction. As an example, railroad tunnels are much larger diameter than BART tunnels, so different machines will be required. Doesn't distance factor into the cost of tunnel boring? Wouldn't it cost double to bore a 4-mile tunnel than a 2-mile tunnel? >>>> Doesn't distance factor into the cost of tunnel boring? Wouldn't it cost double to bore a 4-mile tunnel than a 2-mile tunnel? No, there is a high fixed cost of setting up the tunneling operation, its already expensive before you bore the first yard of tunnel. Tunneling machines tend to be custom made not just for diameter but for soil type. Harder rock needs a different type of machine than soft sand. If drilling below the water table the boring machine needs to be pressurized like a submarine, softer soils need a stronger thicker concrete lining so the bored diameter needs to be bigger to achieve the same internal diameter. ORDER YOUR BORING MACHINE TODAY! Operators are standing by, don't delay! I agree with Bob Smith, it's always been my understanding that entities buy their own boring machine. Thanks for the explanation of why. I'm not a fan of the tunneling and trenching options, but one of my comments at the March community meeting was to ask if we could save cost on tunneling if we joined with other cities and shared the cost of a single machine to tunnel through multiple cities. "we could save cost on tunneling if we joined with other cities and shared the cost of a single machine to tunnel through multiple cities." Given Palo Alto's history of stalling and wheel spinning and demanding gold-lined tunnels, what city would want to work with Palo Alto? Really? I dread that grade separation will be decided by small-town politicians who have no experience or qualifications to be dealing with such an expensive and complex public-works project. Anybody can say "I don't like that option because it's 'too ugly'", but when it comes down to making the project work and not turn out to be a disaster, amateurs will find themselves in over their heads whether those amateurs are members of the general public or city councilpersons.